My cheese of choice has always been pepper jack, and the spicier, the better. If a dish in a restaurant is festooned with cheddar or blue or (gasp) feta cheese, I'll ask for replacement pepper jack or no cheese at all. It's true. I'll now add brie to my list of acceptable cheeses, because if it's always as good as that made by President, I'll like it just fine. The kind folks at President offered to send me a log of their brie, and I gladly accepted. When it arrived, I was delighted to find that they had included some crackers and cranberry relish as well. Such generosity! I opted to share my bounty with my co-workers at our holiday luncheon. After sampling the combination of crisp cracker, smooth and tangy brie, and sweet, tart relish, I regretted that decision. It was delicious--those folks know what they're doing. Unfortunately for me, my co-workers are like vultures and there wasn't a shred left for me to bring home. Fortunately for me, I know where to find more President brie and can recreate this little appetizer in no time at all. For more ideas, you can check out Robin Sue's post on her blog Big Red Kitchen or see what Veronica of Supermarket Serenade did with her log o' brie. Ooooh yum - I bet it's fantastic with that relish. Delish! That really looks delicious. I'd like to invite you to take some time to drop by at Foodista and share this delicious recipe with us. We have launched an online food and cooking encyclopedia ala wikipedia. Add a recipe and you can win a $100 gift card to Sur la table. Don't forget to register first so we know who to thank the recipe for. Thanks! See you there! I enjoy brie, too. It is especially good with jam, like you served it. 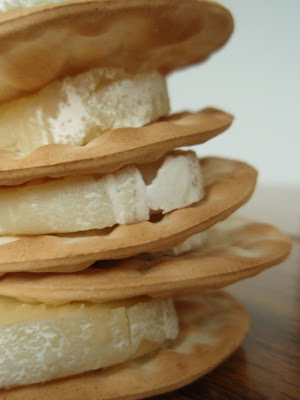 Have you ever tried triple creme cheese? My new favorite is one called Delice d' Argental. It's a French triple creme cheese that has been infused with creme fraiche. Talk about gooey, runny, deliciousness! Yummy...I saw that cheese on another blog and I have been meaning to look for it at Wegmans. I think I get sidetracked by all the other fantastic cheeses in their cheese shop though! I love brie. And weren't you the lucky little devil to get that new one. I'm so glad it's easier to use now. I was just at whole foods the other day and they have this wonderful fig jam out on display that is served with brie...it was so good. Yum is right, cranberry relish sounds intriguing. Yay another fan of the log! Thanks for the mention too! I saw that chutney in Whole Foods, will have to try it out! Try that brie with a little fig jam and you'll be amazed. ~ Oh, I see Dawn had the same idea. I got a log I'm trying to figure out what to do with too :) But I didn't get those fun little accoutriments (sp?) that you did!! My nephew is a chef, so I think I'll have him come up with something fun for Christmas Eve apps! You must add goat cheese to that list! melt it til sopftened, then top with honey and pecans, or apricot jam!..good stuff! LOVE Brie! So yummy and I could definitely polish off that log in no time! My favorite way to have brie is with fig jam, in a hot pressed panini. Try it! I've recently found the beauty that is brie with apricot jam. My MIL pops a wedge of brie in the microwave for 45 seconds so it gets all gooey and we spread it on crackers with a little apricot jam on top. Heaven! but feta and pepperjack? goat! goat cheese and jam!!! I love any kind of cheeses. I also like to serve it with a good pepper jelly. Merry Xmas! Oh the clouds of all cheese, the fluffy, delicate brie! I am cheese whore! 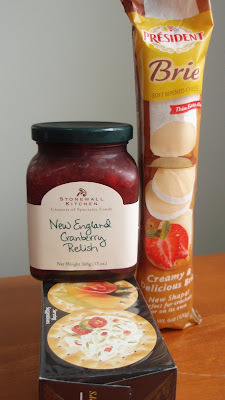 There isn't a cheese I won't try :-p The cranberry relish sounds super yummy. I'll be on the look out for that. Everything on you site looks so yummy! Thanks for sharing and have a wonderful holiday! Super use of "the log." This is a great, quick, easy, fun, tasty appetizer for the holidays! I got all starry-eyes and giddy...I thought your brie was in a squeeze tube instead of a log. i'm still starry-eyed though--I love brie. Whenever people ask what to bring when they're coming to my house, I always say, "A wheel of brie" and no one has ever taken me seriously, but maybe they will when I show them your post. Look for your sussy Monday! Brie in a log! When did they start doing that?? I've yet to try brie but I love all those others that you won't touch. I think think the only ones I don't like are American and "high stinky cheese"! LOL! I love Brie and have made it with cranberries it's a wonderful combination. I usually buy President brie in the round. I have found it is the only one that will not ooze out of my Puff pastry, the other expensive brands do. This sounds delicious! Brie is entirely amazing. Soon you'll graduate to the Brie wheel, poke holes in it, put all kinds of delicious toppings on it and stick it in the oven - that's when you'll know you've gone to heaven. Just about any kind of cheese is my friend. Except for maybe linburger. I just bought some Brie and that looks like a great combo! I love brie! I probably wouldn't have been as generous as you and eaten the whole thing myself;) Love that cracker size log cool!! That looks yummilicious! And I love cheese anything! This does sound very interesting. I love brie, and your combination of flavors sound great! I wrapped brie in pastry puff last year for our Christmas party, I bet the brie would taste really good with cranberry relish in the pastry too! I saw those cute brie logs at the store the other day. The only problem is that my husband and I don't like the rind, we always just scoop out the insides. Your appetizer sounds great! LOVE IT! I love any kind of cheese but brie is one of my favorites. This is the perfect appetizer. (Gasp)that you'd turn your nose up at Feta...mon dieu! Oh, I have some sour cherry jam that would be delicious with a good brie. Thanks so much for the idea, Grace! Hooray for brie! I bet it was fantastic with that cranberry relish. Brie is good but I have never seen it in that shape that is perfect for slicing. What a great idea! I'm back again ... Just wanted to say thanks for pointing out the Brie Log by President. I had not seen it before reading your post, and was thrilled when I found it at Trader Joe's. I'll be slicing it up when company arrives tomorrow ... if the weather allows traveling to happen! My father in law made something with these once and was not at all happy with them. I think if you love the rind, this is perfect, but it won't melt as much. That said, they are super easy for canapes and the like! I've just recently started eating brie, not sure why I never liked it before. I'll have to look for the Presidents brand. Brie is also one of my favorite cheeses...of course, it never hurts when it's served with Stonewall Kitchen anything! Can you believe I've never tried brie or pepper jack?! Holy cow, looks like I'm missin' out :)! Ooo yum. I've wanted to try one of the Stonewall Kitchen things for a while but they're expensive so I haven't. I just recently started enjoying brie as well. It is really good baked. 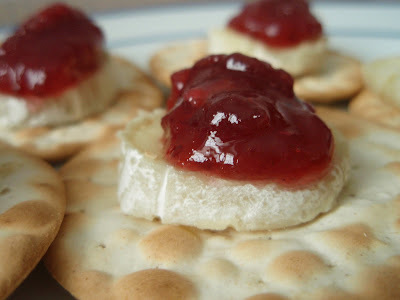 Brie with sweet preserves is pretty close to heaven if you ask me... I tried pepper jack for the first time this Fall in Chicago (it's not big here in the UK...) and fell in love!